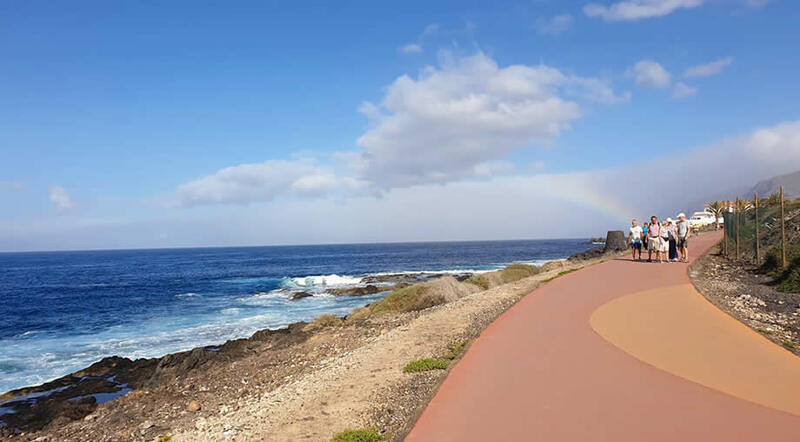 Walking along the coast in Tenerife is pure joy, especially on a sunny day when it's not too hot, like it was the case when we did this trip. We walked from Playa la Arena to Playa San Juan on a warm day in February 2019 and we really took our time to explore the coast and the little market in Alcala that takes place on Mondays. 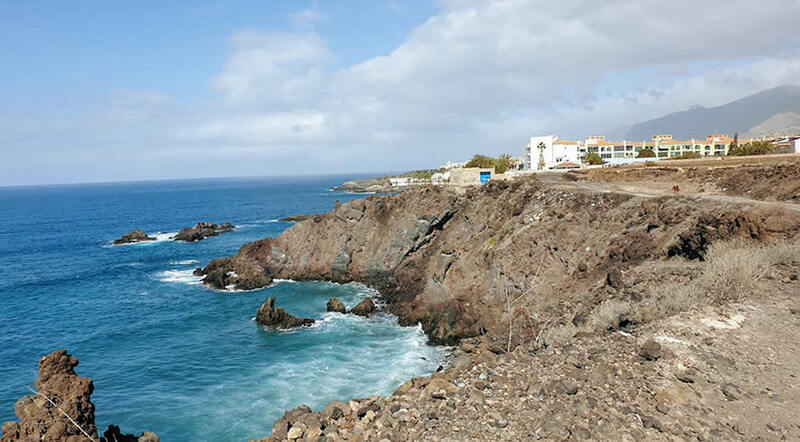 Although on this particular day we only walked from Playa La Arena to Playa San Juan, it is possible to do the entire walk from Los Gigantes to Playa San Juan and make an entire day out of this lovely trip. We actually walked from Playa La Arena to Los Gigantes on other occasions, since we usually prefer to stay in that area of Tenerife and so it's part of our daily routine to walk along this part of the coast. As you'll see next, this entire walk can be divided in several parts and depending on where you are staying and how much you can walk, you can start at different points and go from there as far as you can. This first bit goes on the usual road between the two towns, just walking on the sidewalk along the apartment buildings, shops, restaurants and Playa Chica in Puerto Santiago. This a 1 - 1,5 km walk, depending on where you are starting in Los Gigantes, but it shouldn't take you more than 20 minutes, as you will mostly go downhill if you do the walk in this direction. This is another easy and mostly flat section from Playa Chica towards Playa La Arena. In Playa La Arena you will find lots of restaurants, some overlooking the beach and the ocean, with a gorgeous view of La Gomera on a clear day. If you want to take a break, we recommend that you get an ice cream from the ice cream shop right across the street from the beach and you can enjoy it from one of the benches that overlook the beach La Arena. This is a super popular beach and on days when the sun is out there's lots of people on the beach enjoying the dark sand, even though swimming is often forbidden here, due to the strong currents. From Playa La Arena walk along the sea promenade until it ends and you have to walk to the right on Calle El Mirlo. From the beach Playa La Arena up to the point where you enter the paved road towards Alcala you will walk approximately 1 km. From Calle El Mirlo continue on Calle la Pardela through the beautiful neighborhood of villas until you reach a barrier and from that point you enter on the coastal road. This paved road is an easy walk and all you need to do it comfortably is a pair of walking shoes or sneakers. The views of the coast are really amazing and you'll see the ocean on one side and banana plantations on the other side (on some portions). If you don't plan to walk back as well we advise you to stop at some points along the way to look back towards the cliffs of Los Gigantes, as they look really beautiful and majestic even from this distance. Towards the end, just before you reach the first natural pool in Alcala, the road will be unpaved but it's nothing too difficult to walk and the road will be paved again once you get close to Playa La Jaquita. Here at Playa La Jaquita there's even a nice bar where you can stop for a drink before you continue towards the city of Alcala. We really like this part of Tenerife, the beach La Jaquita and also the big natural pool that is close to it. We often come here just to take a short walk and to read while sitting on the beach or on the rocks close to the ocean. Following the road along the the coast you will get to the small pebbly beach in Alcala and the main square where on Mondays there's a market with fruits and vegetables, as well as clothes, souvenirs and other bits and bobs. This is the most difficult part of the walk, as this part of the road is not paved and you'll be walking on rocks and stones on certain portions of the road. Unfortunately we weren't prepared with hiking shoes on that day and we really regretted wearing a simple pair of Skechers shoes on this section of the walk. Let's say that we were ok while doing the walk from Alcala to Playa San Juan, but when we had to walk back it just killed our feet. So a pair of hiking shoes would be really advisable if you plan to walk from Alcala to Playa San Juan (or the other way around). It's not that it's impossible to do it while wearing sneakers, but it will be much more comfortable if you are wearing proper shoes that are adequate for this type of terrain. We are used to walking long distances and we didn't have a problem with the distance itself, but we would have enjoyed more this part of the road if we would have worn our hiking shoes. If on the section between Playa La Arena and Alcala you see lots of people walking back and forth, due to the fact that most of the road is paved and flat, on this other section of the walk you will see far less people. We walked up to the beach in Playa San Juan and then explored a bit more around town as we wanted to get an ice cream from 100% Pan-Pasteleria, but it was closed as it was Monday, so from the square we walked back towards the path that will take us back to Alcala. take the bus if you get tired. Lines 477 and 473 go through Playa San Juan - Alcala - Playa La Arena - Puerto Santiago - Los Gigantes, so it's easy to divide this walk into several shorter walks that can be done in several days.